ENJOY SILENT & COOL SYSTEM PERFORMANCE The Celsius S24 has been engineered with cutting-edge advancements and premium sound dampening materials to give extreme cooling performance with minimal noise for Intel and AMD CPUs. Featuring smart dual-mode speed controls that are simple to use and have no need for extra software. The fan and pump speeds can be easily managed with an intelligent auto mode or switched to PWM mode for precise user control. 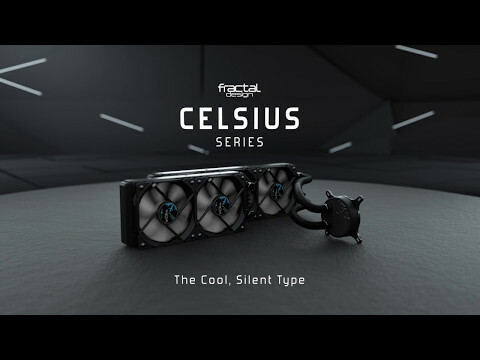 The Celsius S24 boasts two Fractal Design Dynamic X2 fans that offer superb cooling for your build, and features an integrated fan hub and concealed cable routing to give you a clean and efficient system. HIGH PERFORMANCE, LOW VOLUME The Celsius Series uses a wealth of cutting edge technology and premium sound dampening materials to deliver the ultimate cooling performance with minimum noise output. This variety of future-proof features allows your system to stay cool during the most demanding tasks, and aid it to work efficiently for years to come. TWO INCLUDED DYNAMIC X2 PWM FANS Two Fractal Design Dynamic X2 PWM fans offer a wide speed adjustment range from 500 to 2000 RPM allowing for near-silent operation under lighter loads and delivering maximum airflow during intense usage. Even during long gaming sessions your system will receive unmatched cooling from the S24 cooler. FUTURE-PROOF TECHNOLOGY The intelligent temperature-controlled auto mode adjusts your fan and pump speeds in real time to offer the perfect balance of cooling performance and silence for optimum operation, while PWM mode enables fine-tuned manual control for any situation. FAN HUB FOR TIDY CABLE MANAGEMENT The integrated fan hub with concealed cable routing simplifies cable management for clean and organized installation. ENJOY THE GREATEST SILENT GAMING The S24 radiator fittings use standard G 1/4" thread for maximum compatibility and expandability. Easily add and integrate a GPU block of your choice to eliminate noisy graphics card fans so the only sound you hear is the sound of your game and enjoy complete immersion without interruption. 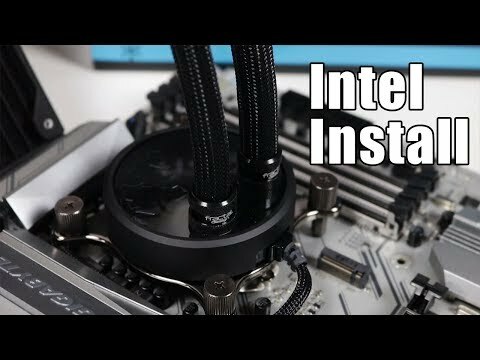 Fractal Design Celsius S24 Quiet Hydro Cooler 240mm For Intel & AMD CPU's is rated 5.0 out of 5 by 1. Rated 5 out of 5 by wacko from Fractal Design Celsius S24 Hydro Cooler Chose a Fractal Design Celsius S24 Hydro Cooler as part of a gaming computer build for my grandson. First class cooler, easy installation for my first build, but I was following instructions in a magazine article which failed to mention that when the radiator is installed in the roof of the case it obstructs the 5.25 bays so no room for an optical disk drive. So what? you might say, well several of the other component drivers come on disks, I had to temporally rig a optical drive onto the mother board from outside the case, it worked, but something to keep in mind.